There aren’t too many new features in these CUs. The most important ‘feature’ is that TLS 1.2 is now fully supported (most likely you already have TLS 1.2 only on your load balancer). This is extremely supported since Microsoft will support TLS 1.2 ONLY in Office 365 in the last quarter of this year (see the An Update on Office 365 Requiring TLS 1.2 Microsoft blog as well). Support for .NET Framework 4.7.1, or the ongoing story about the .NET Framework. The .NET Framework 4.7.1 is fully supported by Exchange 2016 CU9 and Exchange 2013 CU20. Why is this important? For the upcoming CUs in three months (somewhere in June 2018) the .NET Framework 4.7.1 is mandatory, so you need these to be installed in order to install these upcoming CUs. Please note that .NET Framework 4.7 is NOT supported! If you are currently running an older CU of Exchange, for example Exchange 2013 CU12, you have to make an intermediate upgrade to Exchange 2013 CU15. 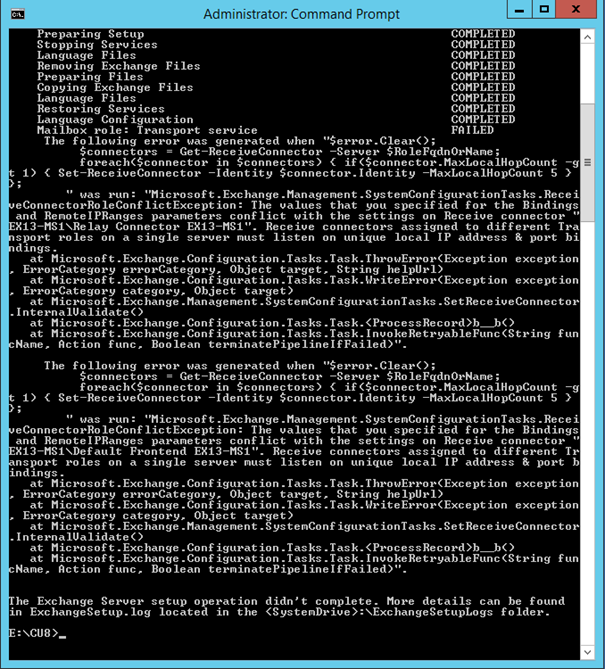 Then upgrade to .NET Framework 4.6.2 and then upgrade to Exchange 2013 CU20. If you are running Exchange 2016 CU3 or CU4, you can upgrade to .NET Framework 4.6.2 and then upgrade to Exchange 2016 CU9. If you are coming from a recent Exchange 2013 CU, there are no schema changes since the schema version (rangeUpper = 15312) hasn’t changed since Exchange 2013 CU7. However, since there can be changes in (for example) RBAC, it’s always a good practice to run the Setup.exe /PrepareAD command. For Exchange 2016, the schema version (rangeUpper = 15332) hasn’t changed since Exchange 2016 CU7. As always, check the new CUs in your lab environment before installing into your production environment. If you are running Exchange 2013 or Exchange 2016 in a DAG, use the PowerShell commands as explained in my earlier EXCHANGE 2013 CU17 AND EXCHANGE 2016 CU6 blog. After rebooting and restarting the setup application the upgrade finishes successfully. 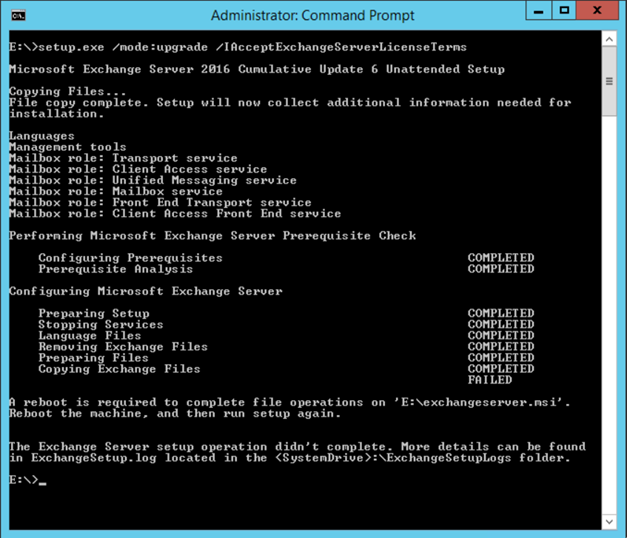 Rebooting the Exchange 2016 server prior to starting the upgrade process does not prevent this from happening. Also, there’s no difference between Exchange running on Windows 2012 R2 or Windows 2016. The installation process has been tested by Microsoft and TAP customers, and tests are still conducted. It is somewhat clear what the root cause is for this issue, it is an MSI package that’s causing this issue. Please be aware that the Microsoft setup application executes around 200 MSI packages, and if only one MSI package is having difficulties you can see issues like this. Because of the number of MSI packages it is not possible to check in advance if your server will experience this issue. At this moment the only solution is to reboot the server when requested and restart the application program. The values that you specified for the Bindings and RemoteIPRanges parameters conflict with the settings on Receive connector ” SERVER1\Relay Connector SERVER1″. Receive connectors assigned to different Transport roles on a single server must listen on unique local IP address & port bindings. On March 17 Microsoft released the 8th Cumulative Update for Exchange Server 2013, 98 days after the release of CU7 which is nicely in line with the quarterly release cadence of Cumulative Updates. This Cumulative Update is called CU8, not a word about Service Pack 2, so SP1 still continues to be the officially supported Service Pack. There are some new features in CU8 that are worth noticing. With CU8 there are improvements for mobile clients in a Hybrid Configuration. When a Mailbox is moved the Outlook client will automatically detect and reconfigure accordingly. This was not the case with Mobile clients. This behavior has changed in CU8. 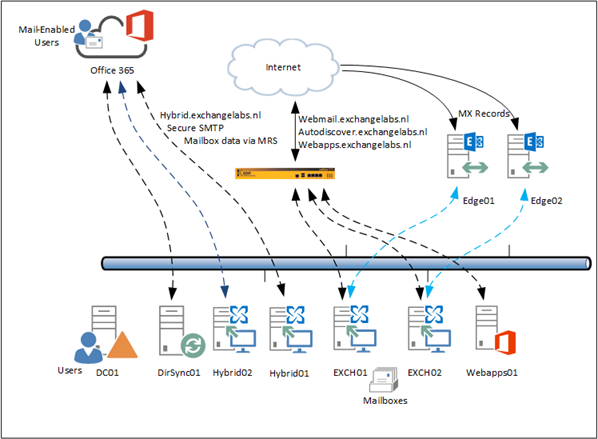 When a mobile client connects the local Exchange server and the Mailbox is moved to Exchange Online an additional check for the TargetOWAUrl on the Organization Relationship object is performed. This will return an HTTP/451 redirect to the mobile client which in turn will be redirected to this new URL. This feature will be available to all EAS compatible devices that can handle the HTTP/451 redirect option. Unfortunately this feature is only available for onboarding customers (i.e. to Office 365) and not for offboarding (from Office 365) customers. There an improved migration for Public Folders migration, now supporting batch migrations. This is faster (supports multiple jobs), more reliable and provides an easier migration management.